Item 3500-20 19” tether is PVC coated 3/64” 7x7 GAC steel cable. R9A-10 terminal ring (#10 screw not included). Split ring has .55” inside diameter. 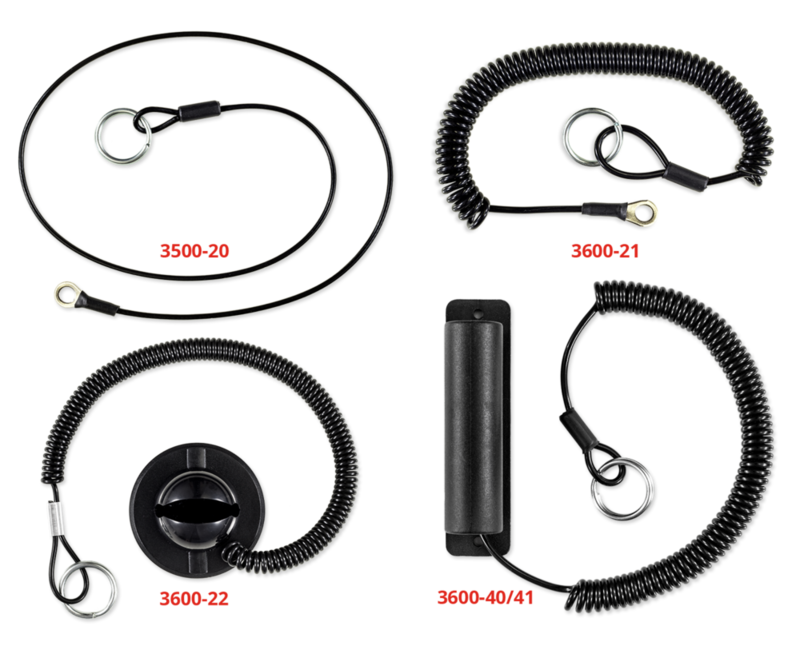 Item 3600-21 Coil tether extends to 30”. R9A-10 terminal ring (#10 screw not included). Split ring has .55” inside diameter. Item 3600-22 1.50” round adhesive back holder can hold items up to approximately 0.50” diameter. Coil tether extends to 30”. Split ring has .55” inside diameter. Item 3600-40 2.75” x 0.75” adhesive back holder can hold items up to 0.44” diameter. Coil tether extends to 30”. Split ring has .55” inside diameter. Item 3600-41 2.75” x 0.75” screw mount holder can hold items up to 0.44” diameter. Coil tether extends to 30”. Split ring has .55” inside diameter. Screws not included.